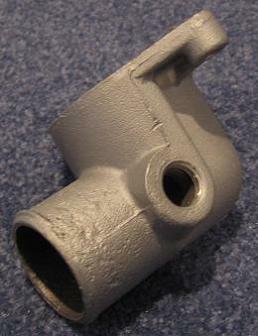 The thermostat housing (also called a water outlet connection in the master parts catalogs) used on 428 Cobra Jet engines is a cast aluminum piece that was also used on other FE engines of the same vintage. 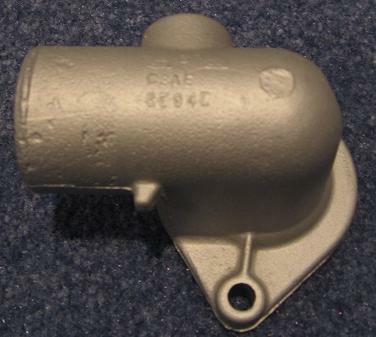 The 1975 Master Parts Catalog identifies the housing using service part number C4TZ-8592-C. An engineering number of C8AE-8594-B is cast into the top of the housing. The housing includes a threaded hole used to mount a distributor vacuum control valve and two holes used to mount the housing to the front of the intake manifold. 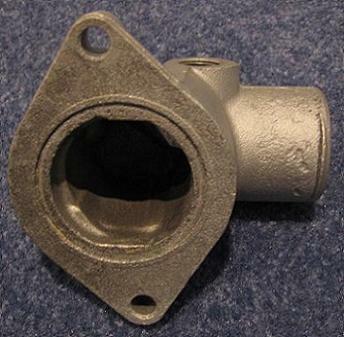 The housing is designed for use with one of two thermostats: a 180° "low temperature" thermostat (service part number A8AZ-8575-B, Motorcraft sales number RT-8) or a 190° "high temperature" thermostat (service part number A8AZ-8575-C, Motorcraft sales number RT-9). Both measure 2 1/8" in diameter. Replacement thermostats are available from manufacturers like Stant in several different temperatures, including 160°, 180°, and 195°. As shown in the picture below, the engineering number cast onto the top of the housing may be difficult to read, with the "B" appearing more like a "D" or an "E". 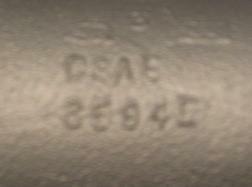 Note that there are at least two different versions of the engineering number casting. On one version the engineering number appears on two lines. A second version, marked "Sheffield" and with the engineering number along one horizontal line, has also been observed. Thanks to Joe Valenti for the picture of the Sheffield version.